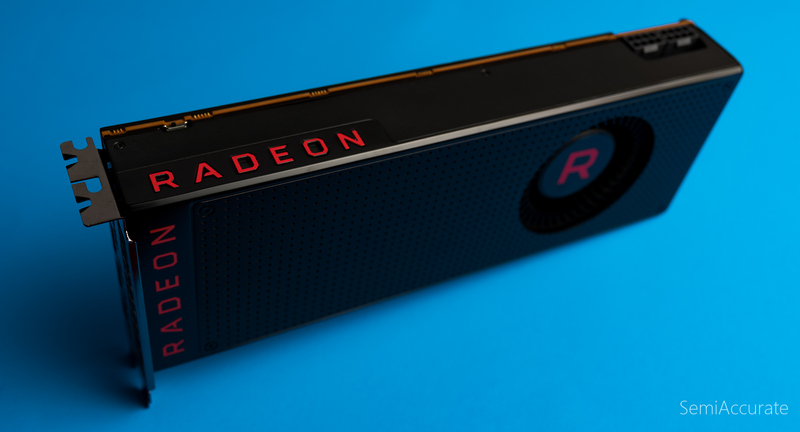 Today we’ll be looking at AMD’s Radeon RX Vega 56 GPU. This is the entry-level $400 graphics card in the RX Vega line-up with the $500 RX Vega 64 and $700 RX Vega 64 Liquid slotting in above it. AMD has promised availability for the RX Vega 56 on the 28th of this month. RX Vega 56 uses a slightly cut down version of AMD’s new Vega 10 chip. As the name 56 implies it has 8 of the 64 compute units physically present on its die disabled. AMD has also seen fit to cut the clock-speed of its HBM2 memory down to 400 Mhz from a top speed of 475 Mhz as found on the higher-end Vega parts. Boost clocks have also been lowered down to 1471 Mhz, but all the texture units and ROPs on the Vega 10 die remain enabled. AMD rates the RX Vega 56 for board-level power consumption of 210 Watts. As our testing will show the RX Vega 56 drew just about as much power as our aftermarket RX 580, but performed notably better. AMD’s gone for the same tried and true reference I/O layout of a single HDMI port followed by three full-size DisplayPorts. I for one would like to see one of these DisplayPort connectors swapped out for a pair of miniDP ports because buying DP to miniDP adapters continues to be a pain. 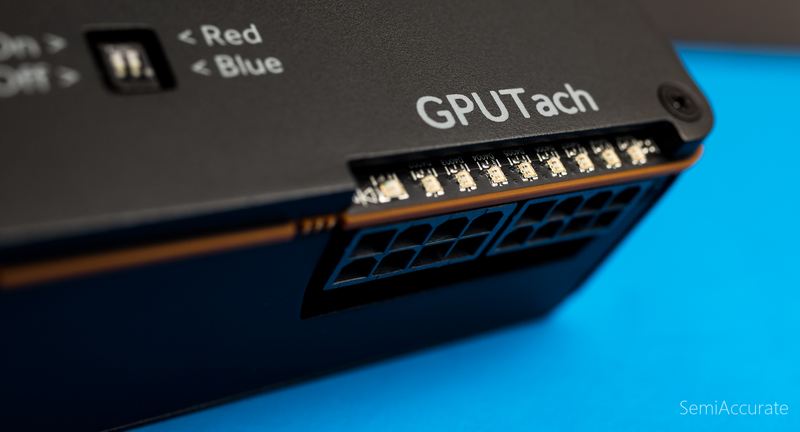 Like the old R9 Fury X AMD is once again embracing the LED craze with a light up RADEON logo on the top of the card and the ever awesome GPUTach here on the end of the board next to the power connectors. 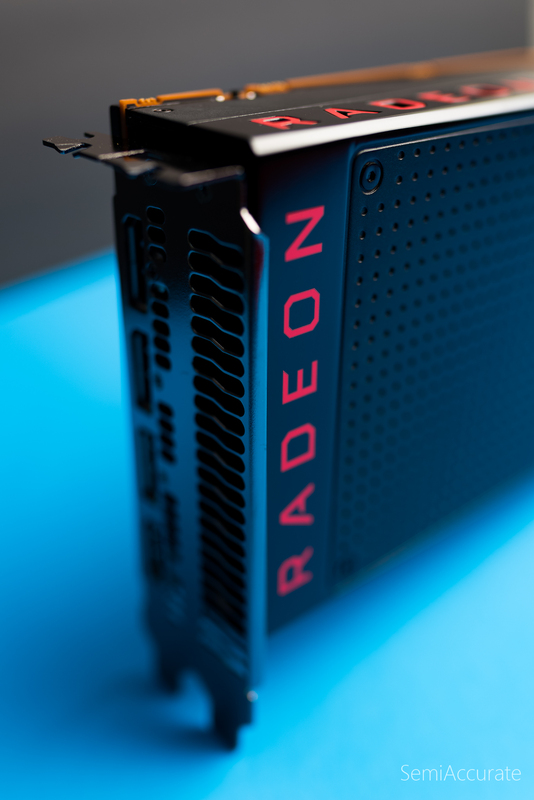 The toggle in the upper left hand corner of the image is a dip switch that can be used to change the back-lighting color of the Radeon logo depending on what’s required for the rest of your PC build. AMD has also upped its game a little bit since the Fury X by including a full backplate on the reference RX Vega models. This is definitely an improvement over the level of build quality we saw with the reference RX 480 and R9 290X. AMD’s using the same reference design for both the RX Vega 56 and the RX Vega 64. This is win for RX Vega 56 owners because it means that they get the same dual 8-pin power connectors and PCB build meant for a 295 Watt on 210 Watt card. That implies ample potential for overclocking efforts, although due to the expedited nature of the testing required for this article that issue will have to lie in wait for another day. One thing I do want to highlight for everyone is the idle power consumption numbers we recorded in our testing. At desktop idle in Windows 10 both RX Vega cards and the RX 580 had essentially the same total system power consumption at ~90 Watts. One of the big things AMD spent time optimizing around for the RX 580 was idle and multi-monitor power consumption. AMD has clearly continued down this path with RX Vega because when we plugged in a second monitor for the first time we thought something was wrong with our power meter. With the RX 580 there’s a 25 Watt power consumption increase when you plugin a second monitor. With RX Vega adding a second monitor raises power consumption by about a Watt. The difference is so small that at first we were having trouble separating it from the normal fluctuations in our power measurements. 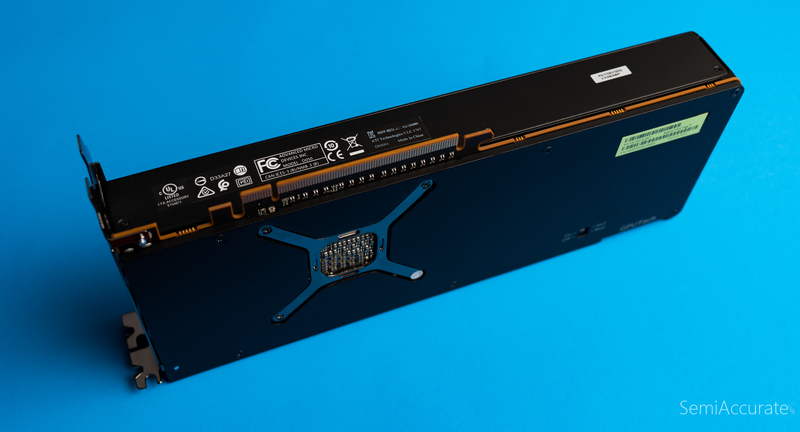 In any-case this is a pretty impressive advancement in power efficiency and I’m a little surprised that AMD’s not taking more time to talk about it. First up we have a match up between AMD’s best RX 500 series GPU the RX 580 and the new RX Vega 56. A quick price check on Amazon reveals that our RX 580 Red Devil is going for $500 new on Amazon. This is a tad more than the ~$250 price point it had at launch or the RX Vega 56’s $400 price point. No matter the price point it’s clear that the RX Vega 56 has a 15 to 18 percent performance lead at 1080P and that lead grows to 27 to 29 percent in our 4K testing. In terms of compute performance Vega 56 is also solidly ahead of the RX 580 with an average advantage of 27 percent. Moving to SteamVR testing the gap widens further as Vega 56 is over 30 percent better than the RX 580. Our power consumption testing points out the improvement in multi-monitor scenarios that AMD’s made with Vega. Given that the raw power consumption of RX Vega 56 is nearly identical to our RX 580 it’s clear that AMD’s pushed the needle forward in regards to the all important metric of performance per watt. Now let’s see if the RX Vega 56 can best AMD’s old 28nm champ, the R9 Fury X. At 1080P it’s clear that Vega 56 and the Fury X are closely matched with Vega maintaining a minor 5 to 8 percent advantage. Moving up to 4K the gap widens to a solid 10 percent. In compute the gap is maintained about 10 percent except for mining where the Fury X offers a 10 percent lead of its own. The RX Vega 56 does clearly blow the Fury X out of the water in the SteamVR test. This mirrors my own experience as I’ve found the Fury X to be a less than perfect VR solution over the last year and a half. I’m personally excited to spend more time with Vega and experience its enhanced VR performance. Finally lets see how big of a chop Vega 56 is compared to its fully enabled Vega 64 sibling. At 1080P the gap between the RX Vega 56 and the more expensive RX Vega 64 is rather small and often on the order of 5 percent. As we move up to 4K this gap grows to something more inline with what the differences in core count and clock-speeds would lead us to expect. The RX Vega 56 offers about 90 percent of the performance of the RX Vega 64 at 4K. We have a similar results in our compute, VR, and power consumption testing where the RX Vega 56 continues to offer about 90 percent of the performance of the RX Vega 64.